in both new and used condition to fit your budget. In-Line Auto Repair & Alignment is a 100% family-owned and operated auto-repair and maintenance facility. We offer everything on your vehicle from oil changes to major engine or transmission repair. We specialize in Foreign & Domestic cars, trucks and SUV’s. We strive to repair or service your vehicle at a low cost price every time. We understand money doesn’t grow on trees. Our overhead is low which means you don’t have to pay dealership prices, to have dealership quality work. None of our employees work on commission, so they don’t recommend anything not needed on your vehicle. Honesty is who we are. We are committed to putting a smile on your face and gaining you and your family as clients for life. Please call us today to schedule an appointment (619) 334-9500. Leave your vehicle with us in the morning and return for it at the end of the day because we know that getting back on the road is important to you. In-Line Auto Repair accepts extended warranties for the work that we do so you can be confident we are taking the best care of you. Our auto shop provides quality auto repair work at a quick pace. 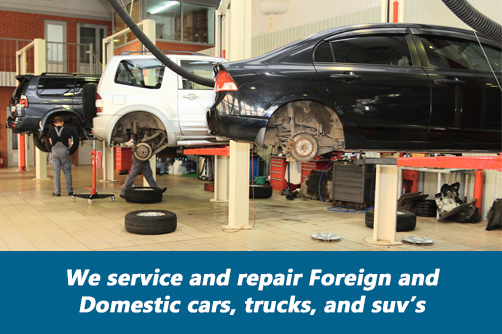 We offer while you wait service for minor vehicle services. Feel free to wait in our comfortable lounge. I Would like to give Inline Auto a 5 star rating! As a new customer I have had several repairs completed on my BMW and Ford Explored. I appreciate the fact that the Owner is very honest and only recommends repairs that are actually needed and will let me know if it is not when I ask. The owner of Inline get personally involved with every repair to insure each repair is done in a timely manner and is repaired correctly by his staff. I have been letting all my friends and family know about Inline Auto because of the Great Service and low prices I have received. Once you go to Inline you won't be satisfied anywhere else. Sincerely, Gene R.
Quality place. They had me in and out real fast. They educated me on what they did which tells me that they stand behind what they do. I will definitely be bringing my vehicles back here again.